Nowadays, Search engine optimization boom is increasing with new ideas and innovations. Most of blogger will prefer off-page On-page Strategies to optimize their blog. If you are business man and need to optimize your Website in Local Area via Local business Listing, Classified ads and blogs, then this blog is for you? SEO strategies are changing day by day, most of people confused about that, what they have learned yesterday that will be out of date on Tomorrow onwards. Get Rid of this Problem, Keep update with our blog WWW.SeoRamanArora.Com, we will provide you update News/Articles of SEO, you will not lag back in SEO Race. 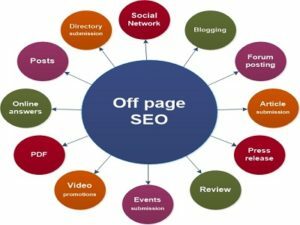 Being an SEO Expert, i suggest you some top Off-page SEO Techniques which will be helpful place to share your Business on Search Engine. Below is a list of some Off-page SEO Techniques people May familiar with them. But, i have added some advanced strategies that you may not know. 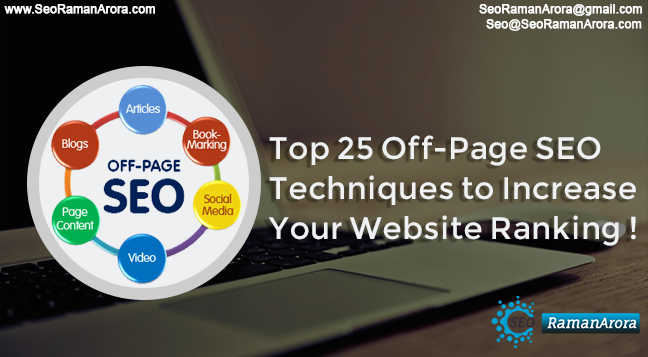 So, try these Advanced Level Off-page SEO Techniques to market your blog/website, get ranked in search Engine as well as increase reputation of Company so you can easily strive in this competitive Digital Marketing World. Note: These things will be done after the Completion of on-Page SEO. Before doing these things you have to aware of competitors who can create a negative reputation against your Website. Social Media is well-known online marketing management system, where you can initiate your online marketing in high range of customers. Create an account and become member of these most popular social Networking Sites like Facebook, Twitter, LinkedIn, MySpace, Instagram, Pinterest and many more. By doing this, you can get connect with your friends, local Marketing as well as update latest posts to promote your website and create your Brand Page as well. To Place your Website in Search Engine, you must have to submit Your Website URL in their Webmaster tools. There is some popular search Engine like Google, Bing, Yandex, Alexa, Altavista, Alltheweb, Lycos etc, listed for free. To Search Webmaster tools of Search Engine type (Search Engine name + Webmaster Tools). Many people say that directory submission may dead. As far as, these are still alive and based upon purely how effectively we select those directories and how we choose their category for Submission. Apart from that, it gives delayed results, but it is worth doing it. Submit your Website Meta title, Description, URL or tags in Topmost Quality Directory Website Such as, Exactseek, gogreece, Submissionwebdirectory. Nowadays, Most of web directories are offering paid listing, so don’t go for it. Social Bookmarking is another good way to promote your website, but mostly people are spamming on social bookmarking sites without knowing how to use them. The content of Social Bookmarking sites update frequently, searches like type and category of sites and often visit them. So, try some social bookmarking sites such as Delicious, Diggo, Stumbleupon, Propeller, etc. You should be very careful while doing this because you are broadcasting your news in world wide area network. This will be helpful to increase the traffic of website which will be depending upon how much you participate in that. Promote your website in local business listing sites, instead of going global and facing high range of competition, so search engine can easily fetch the content and view your website easily. It will help you to reach targeted audience and increase your site traffic in minimum time. Submit your website in Maps, Google Local business page, Yahoo Local, Yellow Pages, Hotfrog, Superpages, etc. Pinging is also another technique to submit your website URL in various websites. This is an easy technique to submit your URL and get back links from them. There are popular Pinging sites such as Pingler, Googleping, Smallseotools and many more. Share or publish your product pictures and make them visible to public. So, your friends and needy people comment on them, which helps to derive the traffic on your website. Do this strategy on major photo shring website such as Picasa, Flickr, Picli, Pinterest, Photo Bucket, Picli Etc. Create a video of your products or services and share them on most popular Video sites like Youtube, Dailymotion, Vimeo to make them in Public. Post your website link in Description and get Reviews, Comments and expert opinions to improve your quality and online reputation. This is a method to increase the link popularity, which can be measured by Search Engine. Exchange your web links with service-related websites, which is main factor of Google’s PageRank Algorithm. Beware of Black-hat while doing Link Exchanges. It means, you have published or copied the news or content of another’s website into your blog. Never forget to place the link of their Website link as reference. Write as read more, do it for other, so after that your content will be trustworthy and other more do for you as reference. This is also another way to increase your web Link popularity. Have you heard about Internal Linking? No, let me explain you! Link to the pages within a website wherever they are necessary. It helps to increases the internal link popularity according to Google Page Rank Algorithm. Best well-known example of internal linking is Wikipedia. Try to get content from blogs/websites which are related to your web theme. Get links from their website using a targeted anchor text (like Wikipedia does). We know that this technique is hard to implement, but these links have more weight as per search engine algorithm. Write reviews about others businesses and ask your clients/friends to write a good review about your business and post it on Google Page and major business review sites like Shvoong, RateitAll, Stylefeeder, Kaboodle and many more. Write unique and quality content of articles and share them on top popular article sharing sites such as Go articles, Ezine, Articlebase, SooperArticles, Now Public, Buzzle, Etc. Although, it’s usually a slow process, but this technique can help you to attain some deep links for your website reputation. If you are running a business or Service provider then go for PR Submission. Get more popular PR Submission sites like open PR, PR Leap and many more. It will help you publish your website in Google News. Post some Ads on free classified sites to advertise your product. Try high classified sites such as YouJingles, Olx, Quikr and other more. If you have an e-commerce website, then it’s good technique to advertise and brand your product for free. Post your products in Yahoo online shopping, Google Product Search, Bing online shopping and other major social shopping network sites. Create an Account in Question/ Answers sites and participate in answers asking by needy peoples, along with that you can place your website link in source section, if necessary. Don’t post irrelevant web links on these websites. If you create an violation, then this is another way t increase link Popularity. Try some top popular Question/ Answers websites like Quora Answers, yahoo Answer, Answer Bag, Cha-cha. Create a doc file with Website Content or business services as well as place some website links and convert it into PDF. Share this file into top PDF Sharing Websites like issuu, scribd,slideshare, dropbox, docspal. Infographic has become much popular over the internet. Submit your Infographic website submission and provide reference links to your homepage. These image differs from other website images, which will be helpful to drive the traffic. Some popular Infographic sites are Visual, reddit, Submitinfographics, Nerdgrpah and many others. Your wonderful representation can attract a person, which is possible only in PPT. So, create presentation of your website and services and share them on most well-known website such as SliderShare and many more. If you are offering services related to Web Design, submit your website in W3C and CSS website directories which may drive the traffic to your website. Along with, Submit your website in RSS feed directories, which also will help you to attain traffic on your website. Create some innovative and interactive gadget/widget applications (online poll or gaming widgets) for your website and publish them on blog and social networking sites like Facebook, Twitter, and LinkedIn. Let your friends to vote/play and use this application which will help you to increase website traffic and branding. At the end, when no one technique will work for you, then go for PPC ad campaign with some targeted keywords. Remember, you have to pay to drive this traffic towards your website through Google Adwords or PPC (Pay-Per-Click). Important Note: Always keep in mind you have to be careful while implementing these Off-page SEO Techniques. You should not post any spam or overdo. Whatever you do, just make plans and execute. Otherwise, you can see adverse effects. If you Like this Blog, Please share, Comment or Subscribe our Youtube Channel. Previous Post:Nofollow Tags Guide Covering Why Use Nofollow Tags On Your Site ! Thanks for posting such a informative post and keep posting. Thank you Pavitra Kumar ! I have already published an Article for Keyword Density ! Please go through with this Article. Nice Blog and also help me to improve my knowledge. Can u please consider me that .. is it compulsory to write a content as an intern in a office . Where article and blog content or also any website page content?